The existing level crossing on Steeles Avenue East at the Stouffville GO railway limits the movement of pedestrians, cyclists, transit and vehicles in the area. There are daily issues of congestion and many road users experience difficulties travelling along and across Steeles Avenue East. The purpose of the EA was to evaluate alternatives to address the increasing need to build a bridge (road over rail or road under rail) in order to improve traffic congestion, safety, access and connections for all road users on Steeles Avenue East between Kennedy Road and Midland Avenue. Additional considerations included the widening of vehicle lanes from 4 lanes to 6 lanes as well as bicycle lanes and pedestrian improvements. 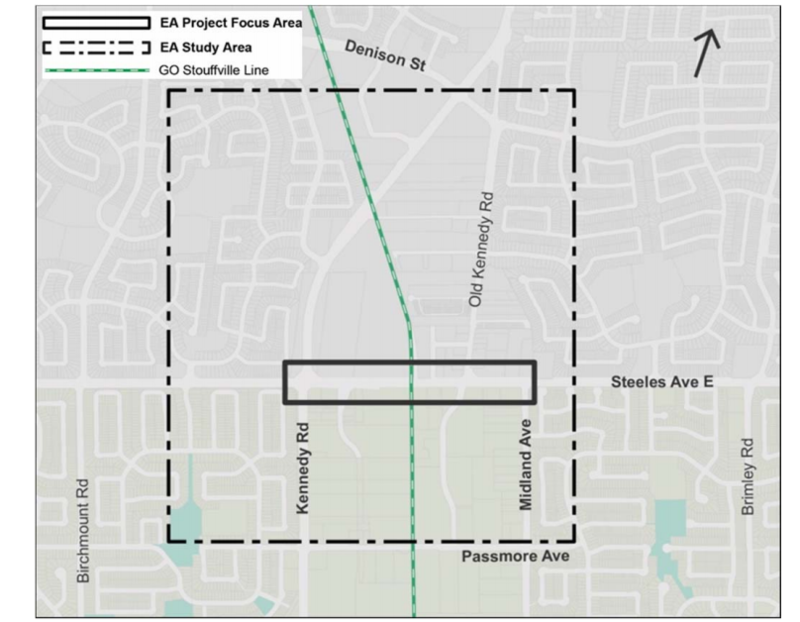 The Steeles Avenue East Bridge study report was completed and issued for a 30-Day public review period from March 9, 2017 to April 7, 2017. Members of the public that were unable to resolve their concerns about the project with the City had the opportunity to request that the Minister of the Environment and Climate Change invoke Part II of the Environmental Assessment Act. The Part II Order request is an appeal provision for elevating the status of the project to an individual environmental assessment. During the thirty day review period, two letters requesting Part II Orders were sent to the Minister and copied to the City of Toronto on March 31, 2017 and April 6, 2017. The Ministry of the Environment and Climate Change has completed its review of the Part II Order requests. The City of Toronto received the Minister’s decision on July 7, 2017 which denied the above requests. Read Minister Glen Murray’s Letter of explanation for the decision. The City of Toronto staff are working with Metrolinx to coordinate the Steeles Bridge implementation phase which will be carried out by Metrolinx. This coordination requires further work before a plan and schedule for detailed design can begin. Two previous studies have been conducted for a bridge crossing of the Stouffville GO Rail Corridor at Steeles Avenue East. Key finding of both reports are provided below. The 1994 Environmental Study Report was initiated by the former Metropolitan Toronto because the area had undergone significant redevelopment and increasing traffic volumes were resulting in greater conflicts between rail and road traffic. Based on the analysis and evaluation of alternative bridge designs, an overpass (road over rail) was recommended. Widening Steeles Avenue East from 4 to 6 lanes with streetscaping and bicycle lanes was also recommended to help alleviate traffic congestion. In August 1996 Metro Council put the construction of the bridge crossing on hold due to the costs for property acquisition, potential reduction in usage of the rail line, and questions from adjacent property owners regarding the design. As a result of budgetary constraints and uncertainty related to adjacent development plans, the bridge crossing of the rail corridor has not yet been constructed. Given the period of time that has elapsed since the completion of the two former studies, the City of Toronto is initiating the Steeles Avenue Bridge EA to revisit and revaluate alternatives for a bridge crossing the rail corridor and the need to widen the existing roadway. This study will take into consideration the previous studies completed together with the changes to the community that have taken place. The City has completed the Steeles Avenue East Bridge study report and issued it for a 30-day public review period from March 9 to April 7, 2017.